Earlier today, we reported that The CW is giving its Arrow spin-off The Flash its own stand-alone pilot, scrapping plans for a back door pilot that would air as Arrow's 20th Season 2 episode. The character is still set to debut in the upcoming episode "The Scientist", airing Wednesday, December 4 on The CW, and now we have our first photos of Grant Gustin as Barry Allen, before he turns into The Flash. The character is also appearing in "Three Ghosts" on December 11. Check out the first photos of the former Glee star inhabiting his new role. 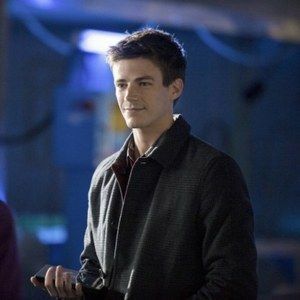 "A seemingly impossible robbery at Queen Consolidated's Applied Sciences Division brings Central City police scientist Barry Allen (guest star Grant Gustin) to town. Citing a similar case back home, Barry offers to help Oliver and team with the investigation. Oliver senses there is more to Barry than meets the eye, but he's distracted by the similarities between this current case and something that happened on the island. Meanwhile, Felicity takes a liking to Barry, which doesn't go unnoticed by Oliver. Sin (guest star Bex Taylor-Klaus) asks Roy for help when a friend of hers goes missing. Roy is surprised when Thea not only encourages him to help, but joins the search. Unfortunately, Sin's friend is connected to Brother Blood (guest star Kevin Alejandro), and their search ultimately gets one of them seriously injured."